The following appliaction is an example of UTXvSZR application at MV substation which controls 3 switches of power transformer and coupler. 3 phase voltages from every section each and one voltage from power transformer upper side each are all connected to UTXvSZR. With regard for UTXvSZR universal character it is possible to connect phase or interfacial voltages to given group. 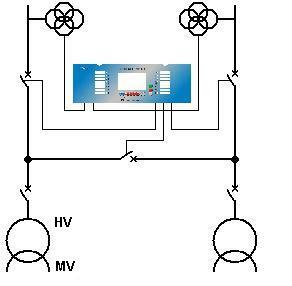 The following application is an example of UTXvSZR application at MV substation which controls 5 switches of power transformer at the side of MV, HV and coupler. 3 phase voltages from every section each and one voltage from power transformer upper side each are all connected to UTXvSZR. With regard for UTXvSZR universal character it is possible to connect phase or interfacial voltages to given group. 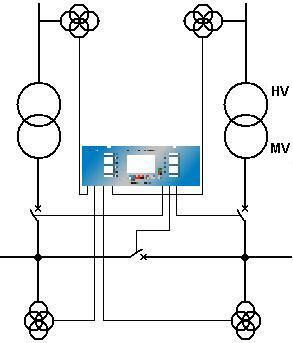 The following application is an example of UTXvSZR application at HV substation which controls 3 switches of line and crosspiece. SZR software includes programs of so called linear sequence, which means switching on the linear sequence in case of one of lines voltage loss. It is possible to configure SZR software in a way to implement the line prioritisation. 3 phase voltages from every line each are connected to UTXvSZR. With regard for UTXvSZR universal character it is possible to connect phase or interfacial voltages to given group.